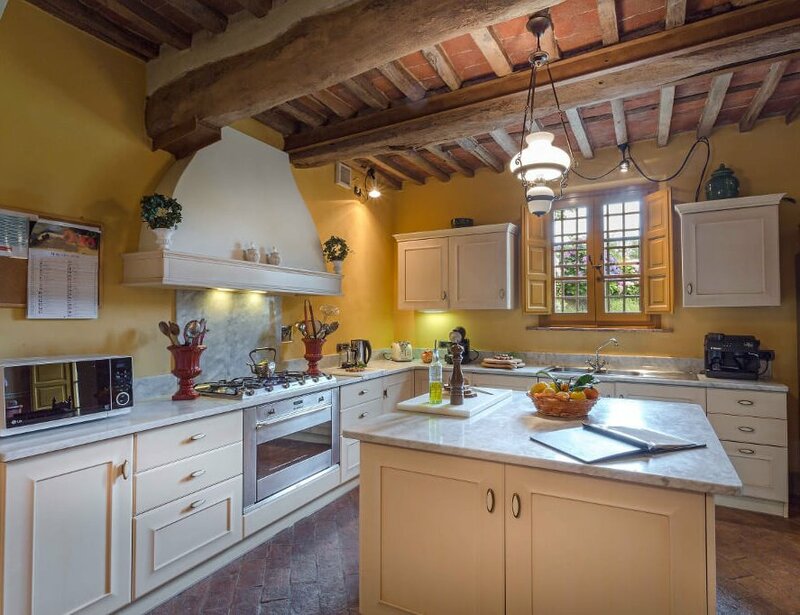 Formerly a private olive press for a wealthy Italian family in the 16th century, this villa is full of historical allure and surrounded by terraced olive groves with stunning views of the valley below and Lucca's medieval towers. 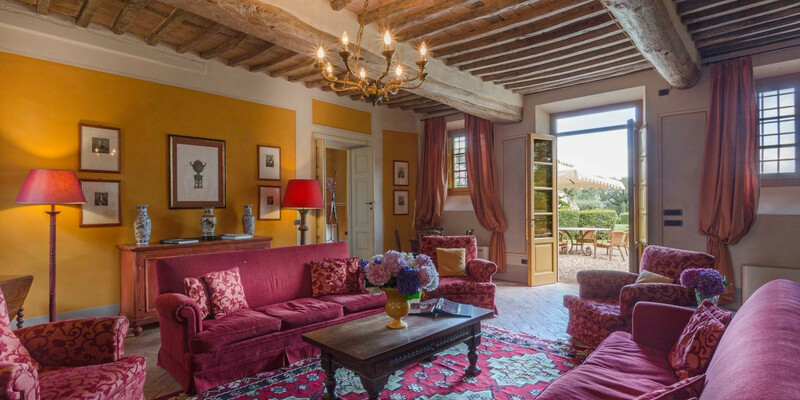 Fully restored yet retaining much of its historic allure, this villa is ideal for those seeking to enjoy a relaxed Tuscan break within easy reach of must-see cities including Lucca, Florence and Siena. 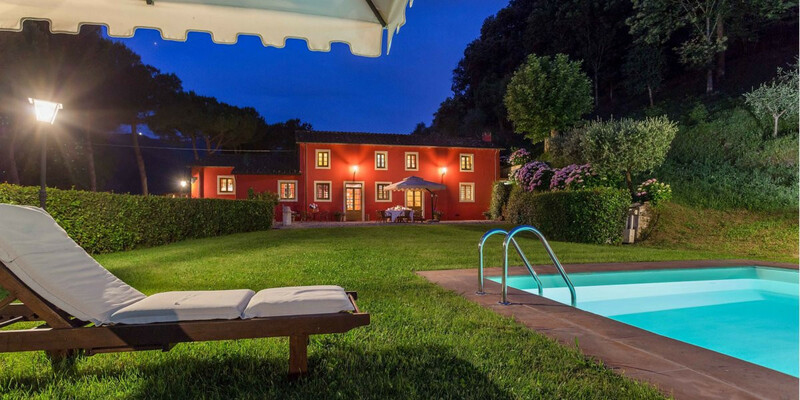 The floodlit, spacious pool backs on to this striking red-earth coloured villa, bordered by sun loungers which mirror the avenue of trees behind them. 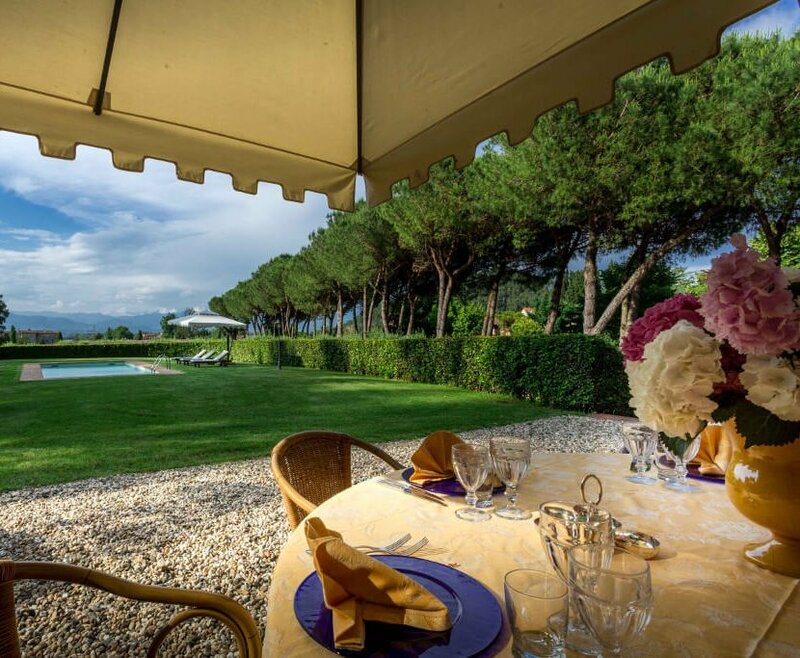 From the pool, guests can enjoy fantastic views of the valley and Tuscan countryside, as from the al fresco dining and barbecue area. Fresh blooms and manicured lawns entice guests to spend many a day in this lovely garden. 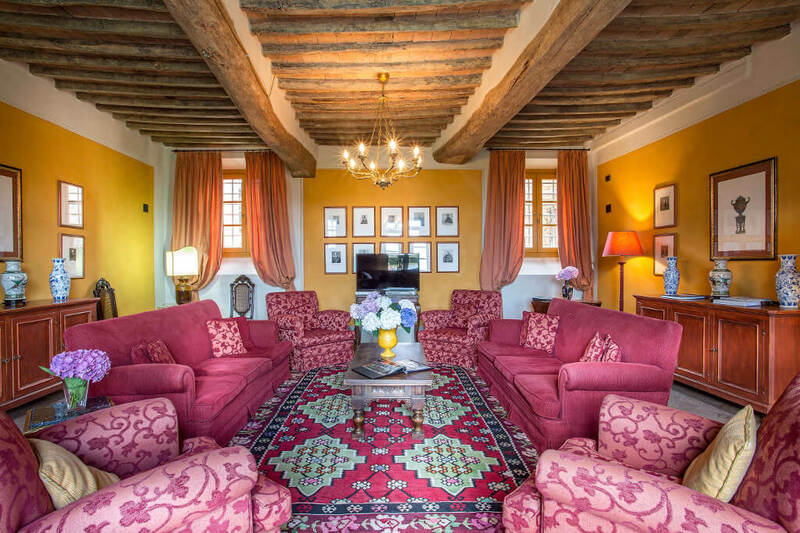 If you can be torn away from the pretty garden, indoors you will discover the perfect equilibrium of traditional Tuscan country living and modern luxury convenience: exposed wooden ceiling beams and traditional, warm prints on soft furnishings provide a comfortable interior where guests can unwind and relax. The lounge area is spacious and comfortable, while the kitchen is fully equipped and features a lovely tiled floor and large dining table seating 8, in keeping with gastronomy's position at the heart of Italian culture and family living. Each of the 4-bedroom suites is individually styled to luxury standards while maintaining a hard to capture sense of traditional charm and ambience. The 3 double and one twin rooms are all accompanied by en suite bathrooms. Short distance from Lucca (6km), typical Tuscan oil mill immersed among olive groves with a fantastic view over Lucca and a big park. Outdoor facilities feature a beautiful pool with sun-beds, a superb alfresco dining area with BBQ. 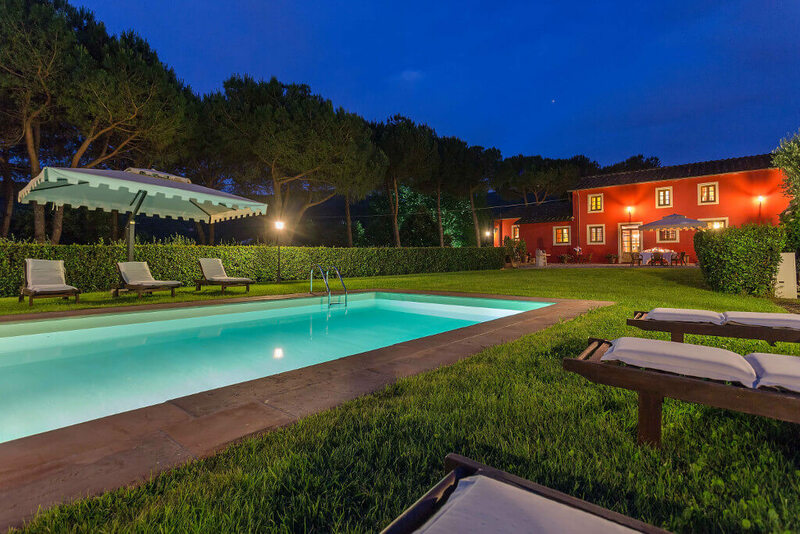 Owned by the famous noble family Controni, today it’s an elegant villa rental with 4 charming bedrooms. It comes out with personal chef and housekeeping and includes: Wifi, air-conditioning, Tv-sat,centralized music system, parking and laundry. At the foot of Mount Pisano, in the valley of Vorno, (6 km from Lucca) is situated this beautiful typical Tuscan oil mill , immersed among olive groves. 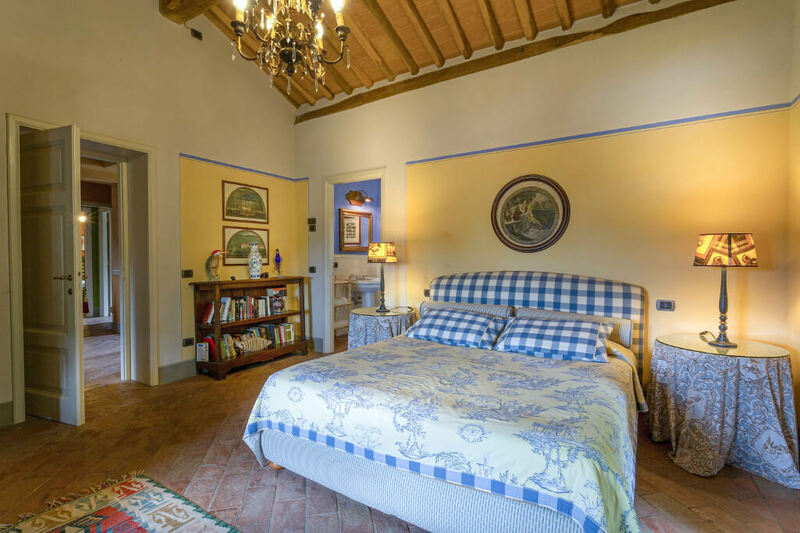 The property was first the private oil mill of the family Controni and then used by the famous architect Felice Matteucci who invented the first stroke engine (prototype to the modern day motor car) in his workshop next to the Villa. Matteucci was the son to the renowned minister of Justice of the Republic of Lucca and the noblewoman Angiola Tomei Albiani. 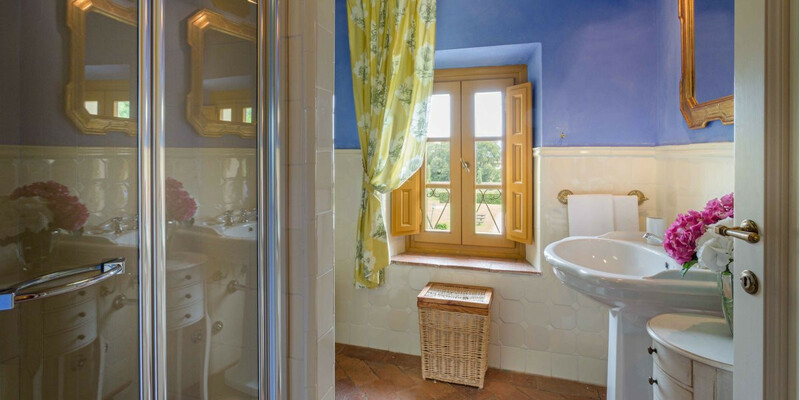 Today it’s a charming villa rental with 4 beautiful bedroom with bathroom ensuite. A place rich in history and traditions equipped with all modern comforts: wifi, air-conditioning, centralized music system and sat.TV. 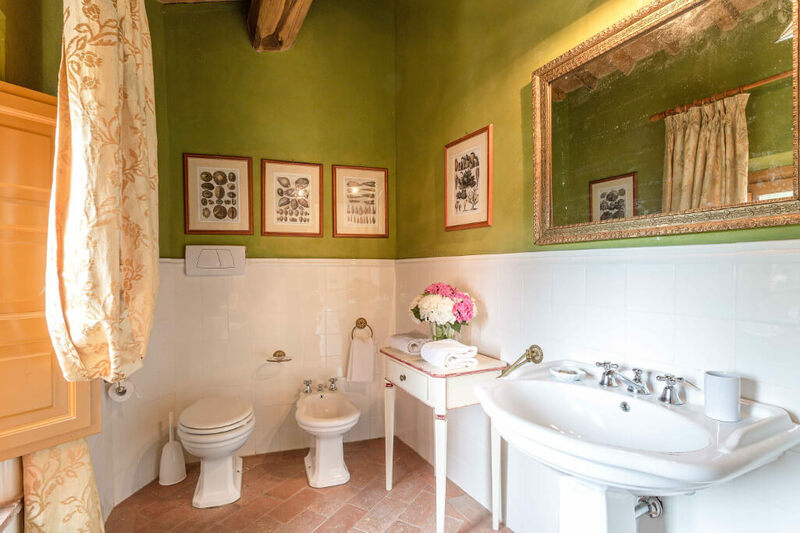 Il Frantoio offers elegant accommodations renovated with extreme care for details. Your reservation includes a personal chef and housekeeping. 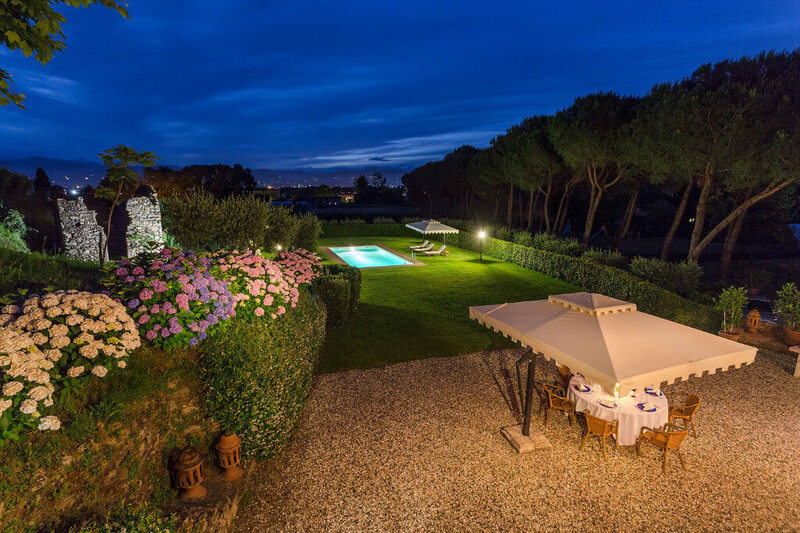 Outdoor facilities feature a beautiful swimming pool with sun loungers and deck chairs, a superb alfresco dining area with BBQ and a unique view over Lucca’s areas. The two floors oil mill offers accommodations full of charm with rustic yet elegant details, such as the original terracotta floors and wooden beamed ceilings. Ground floor: a huge living room with sat.TV and DVD player and a nice leisure room with sofas and board games. The beautiful living room has access to the outside dining area and to the park. 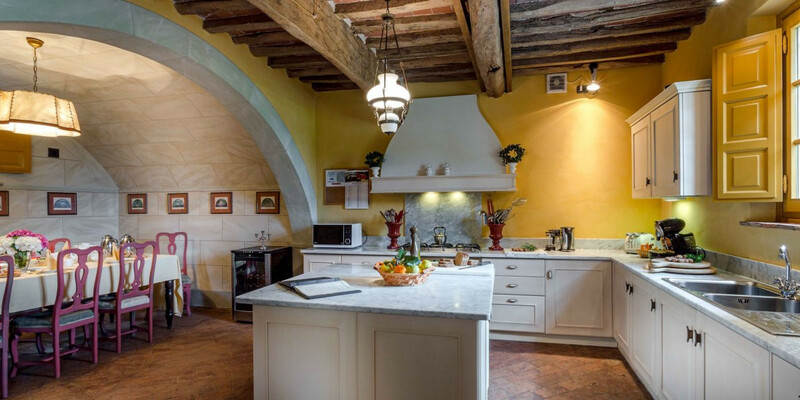 The kitchen is fully equipped with a centre island perfect for cooking lessons. On this floor there is also a nice laundry room with washing machine and dryer. First floor: 4 marvellous bedrooms with en-suite bathrooms. Every bedroom has a queen size bed and Baby cot is available at extra fee of 122 euro per week. Every bedroom has air conditioning, heating system and a safe. 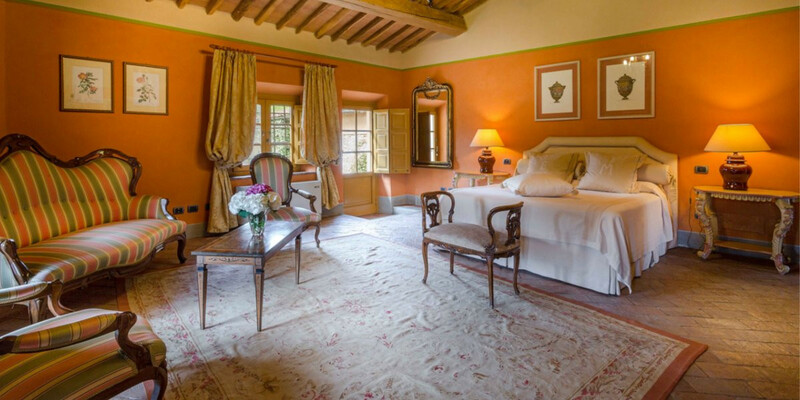 Some bedrooms overlook the pond close by, others the garden, swimming pool and olive groves. Every bathroom has a shower and some a bath tub. 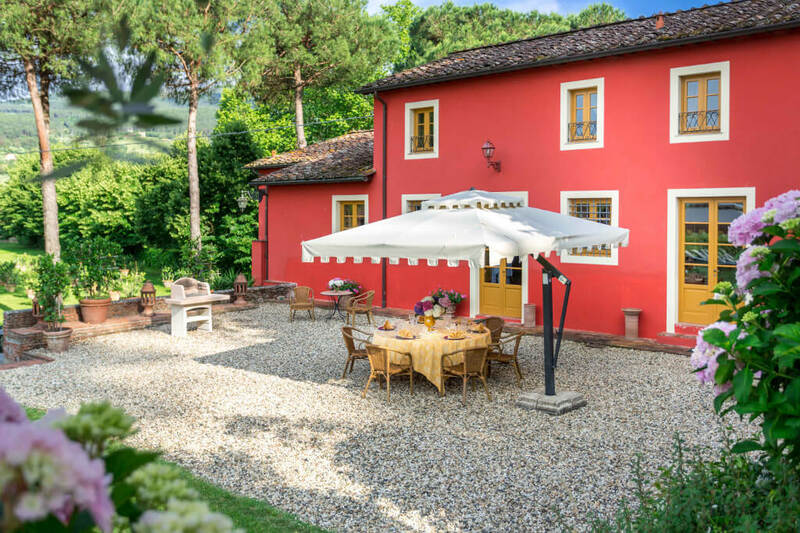 Il Frantoio is a place where you will find peace of mind while having fun time with your family. Get a relaxing massage looking at the sunset by the swimming pool or enjoy an entertaining group cooking lesson, taste the flavours of our territory through a fine wine tasting. On request at extra charge you can also benefit from our extra service, making your stay really unique and unforgettable. A personal Chef is at your completely disposal for preparation of breakfast and one meal (lunch or dinner) 6 days a week (Wednesday day off). Cost of groceries not included. Customers will be charged 12 euro per breakfast per person and 40 euro per meat meal or 45 euro per fish meal per person to cover the cost of food and beverages. Maid service is included (sunday off). It’s very difficult to find an accomodation with so many services and amenities. Il Frantoio is located in the famous area of Vorno: a gracious small village at the foot of the Mount Pisano, which separates Lucca from Pisa. A place rich in history and beautiful nature: small streams, breath-taking landscapes and amazing panoramas. This particular area of Lucca countryside offers many kind of outdoor activities: hiking (Pizzorne and Mount Pisano), tours of the historical Villas (Villa Bernardini, Villa Buonvisi etc. ), fitness trails (Marlia), nature reserves (Gherardesca lake, WWF Bottaccio oasis), termal baths (San Giuliano Terme). Horseback riding lovers will be delighted to enjoy a ride in the wild, just a 10 minutes drive away, in a beautiful horse farm. For tennis and golf players, an exclusive Tennis & Golf Club is just a 5 minute drive away. A relaxing but also entertaining vacation in a landscape full of history.